Biometrics technology is based on unique human characteristics. 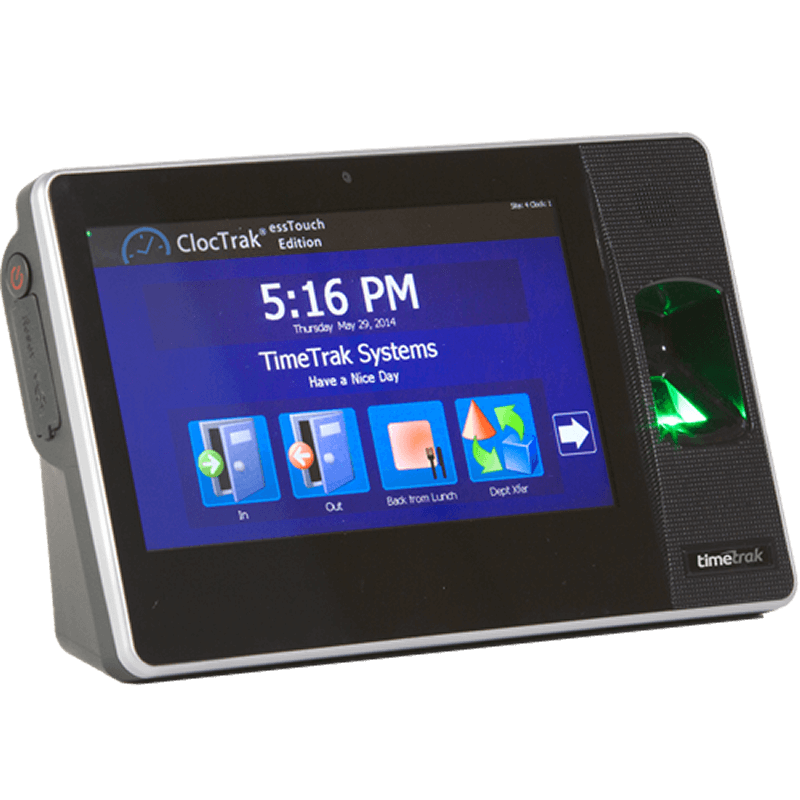 The popularity of biometrics-based time and attendance terminals continues to increase and TimeTrak has been involved since the company was founded in the 1980s. While there are many biometric technologies to choose from, TimeTrak offers three of the most reliable forms of biometric validation available – fingerprint recognition, hand geometry recognition, and a camera to view pictures. Below is a listing of our most popular Biometric terminals. TimeTrak’s essTouch Smart Terminal offers the latest in Employee Self-Service and Time and Attendance data collection benefits, through its bright, 7″ graphical touch screen user interface. Plus, each unit is equipped with an integrated digital camera for capturing pictures, providing passive biometric validation for increased accountability. For businesses with more advanced validation requirements, the essTouch supports both RFID badge and biometric fingerprint readers. No matter your environment, the essTouch series provides a perfect balance of performance, flexibility, and accountability. TimeTrak’s Model 900 Series data terminal is the latest in our line of Innovative Smart Terminals featuring Microsoft’s Windows CE operating system, offering an expanded array of time & attendance transactions types required in today’s dynamic, data-driven work environments, especially labor transfers between departments, jobs, cost centers, and task codes. The Model 900 also provides employee self-service benefits to your entire staff – both hourly and salaried – including ‘live’ access to labor hours and details, PTO balances, schedules and time card information including history. 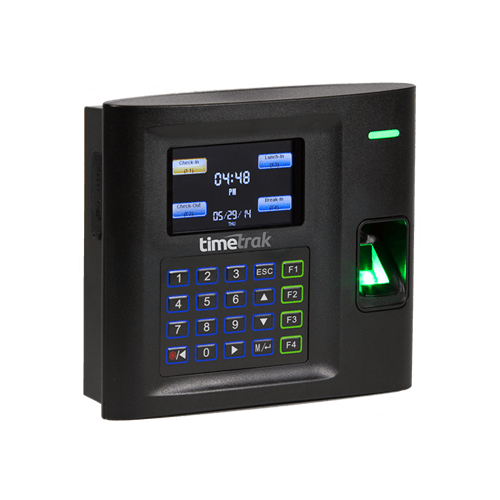 TimeTrak’s Model 100 Fingerprint Clocks are innovative time and attendance readers offering unparalleled performance and value. TCP/IP communication is standard and will ensure that data transmission between the terminal and the TimeTrak host system is automated, easy and error free. The USB port can be used to transfer the data to and from a USB flash drive. TimeTrak’s Handpunch Series Terminals use field-proven hand geometry biometric technology. The terminal captures a three-dimensional image of the hand each time the employee punches. The hand’s size and the shape are used to verify their identity with unparalleled accuracy. Green and red lights notify the employee of the status of each punch. There’s no question anymore, employees have to be there to punch. With TimeTrak’s advanced biometric terminals, employers are able to choose how stringently they wish to use biometrics by combining various forms of validation to meet their needs, such as Card Readers (Barcode, Magnetic Stripe, Proximity), PIN and Camera with fingerprint recognition and hand geometry recognition. The more aggressive forms of biometrics include fingerprints and shape (geometry) of the hand, where systems can verify and block employees from transacting if fingerprints or hand shapes don’t match what is on file for the employee. Systems can be structured to be less aggressive with the use of a camera, where after employees fingers don’t verify on two or three tries, the camera comes into action and takes a picture to send along with the transaction, permitting an employee to always be able to punch/transact and never be able to claim the data collection terminal wouldn’t read his finger. For union situations and government organizations that encounter resistance to finger and hand shape biometrics, and the organization still wishes to keep in place a general sense of honesty, a camera can be used to take a picture with each punch/transaction – effectively a passive manner of biometrics whereby supervisors that may have a question or concern can check the picture connected to the transaction, or do spot checks of employees or departments, reviewing all pictures for a range of dates.